The Village of Brambles is a 55-plus community located in Southaven, Mississippi. The community features new and resale attached homes and boasts a low-maintenance lifestyle. Homeowners at The Village of Brambles will have access to various private amenities, while residents will enjoy living in modern, well-lit homes. Its location near Memphis, Tennessee means homeowners are close to big-city entertainment, but still far enough away for a quaint, relaxed lifestyle. The Village of Brambles features a private clubhouse, which has a banquet room, kitchen, and exercise room. Homeowners will also enjoy the community’s many walking and bike trails, which surround a park in the center of the community. Construction on The Village of Brambles started in 2012. Upon completion, the community plans to include 90 homes. These homes come in floor plans that have 1,185 to 1,584 square feet of living space. They have two or three bedrooms, two bathrooms, and a two-car garage. These homes include features like high ceilings, gourmet kitchens, and private patios. Homeowners at The Village of Brambles can enjoy cycling, exercising, and various community events. The homeowners’ association fee covers outside maintenance like lawn care and water, meaning residents have more free time to spend with friends and family, as well as exploring new hobbies. Just minutes from the community in Southaven is a Kroger as well as an Aldi for residents’ grocery needs. Also in the area is a Target, Sears and Ross as retail options, as well as an Olive Garden, Sonic, and TGI Fridays for food. Golfers will be glad to know both Wedgewood Gold Club and Southaven Golf Center are nearby. Homeowners will also find ample hunting and fishing opportunities throughout Southaven. Baptist Desoto Hospital is the main hospital servicing the area and several doctor’s offices can be found nearby. There is a CVS and Walgreens a few minutes away as well. Interstate 55 is just a five-minute drive from the community. From there, downtown Memphis is 25 minutes north. There, residents can visit Graceland, take the Memphis Music Tour, or catch a Memphis Grizzlies game. Homeowners looking for a trip farther afield can fly out of Memphis International Airport. 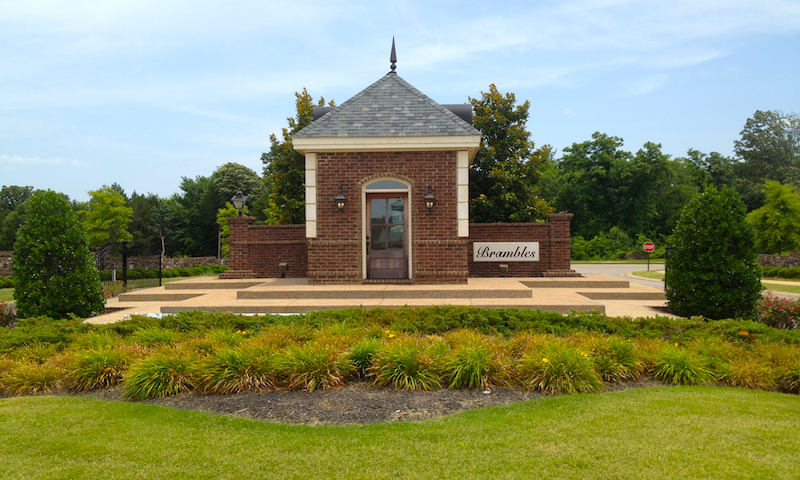 All of this makes The Village of Brambles an ideal 55-plus community in Southaven, MS. There are plenty of activities available in The Village of Brambles. Here is a sample of some of the clubs, activities and classes offered here. These homes come in floor plans that have 1,185 to 1,584 square feet of living space. They have two or three bedrooms, two bathrooms, and a two-car garage. These homes include features like high ceilings, gourmet kitchens, and private patios. 55places.com is not affiliated with the developer(s) or homeowners association of The Village of Brambles. The information you submit is distributed to a 55places.com Partner Agent, who is a licensed real estate agent. The information regarding The Village of Brambles has not been verified or approved by the developer or homeowners association. Please verify all information prior to purchasing. 55places.com is not responsible for any errors regarding the information displayed on this website.